This is the form to order single printed cards, to be handwritten by and mailed from MAZON Canada's national office. If you would like to order blank cards to handwrite yourself, or if you would like to order multiple cards to be sent from our office, please contact us at info@mazoncanada.ca or by calling 416.783.7554 or 1.800.MAZON.22. All information will remain confidential. Age is optional is collected only for demographic research. 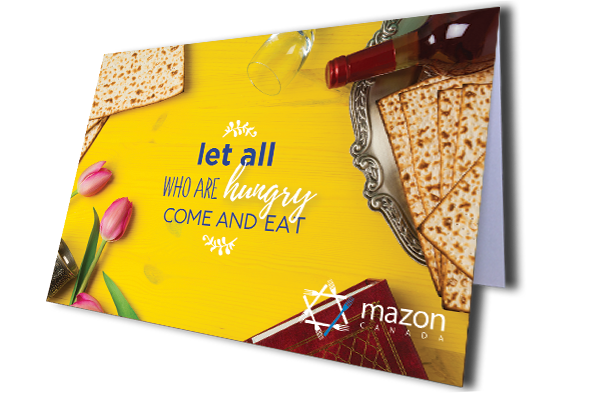 Your recipient will receive a printed card notifying them that a donation has been made in their honour to celebrate Passover. Please SIGN YOUR MESSAGE with your name, so your recipient knows who sent the card! Your name will not by default be written anywhere else on your card. Do not click "Next" unless you have selected "In Honour Of" and filled out your recipient's information!